For busy gay and lesbian families, it seems there’s just never enough time. But when it comes to planning for our financial future, there’s always too much “T.I.M.E.” T.I.M.E. stands for Taxes, Inflation, Mistakes, and Emergencies. Building a nest egg that can withstand the test of T.I.M.E. requires careful planning. We can’t change T.I.M.E., but there are some steps we can take to help minimize its ravages. The old saying is that only two things are certain in life: death and taxes. It’s true, we can’t evade taxes, and as gays and lesbians we are denied some of the tax advantages of getting married and having a family. Fortunately, some financial products do have particular tax advantages, allowing us the opportunity to recoup some of our losses. Permanent life insurance, which is purchased for death benefit protection, has three distinct tax advantages: cash value accumulates within the policy on a tax-deferred basis; loans taken against cash value* are generally not taxable; and in most instances, the death benefit paid to beneficiaries is free from federal income tax. However, you will need to be sure you can name your partner, and/or your child if you are not the legal parent, as the beneficiary. A fixed annuity is another product that puts the power of tax-deferral to work for you. With a fixed annuity, you won’t pay taxes on your funds while they’re growing, only as you withdraw them. Withdrawals prior to age 59-1/2 may be subject to a 10% early withdrawal penalty. Again, it is important to use financial vehicles that will allow you to roll your assets over to your partner and/or a nonlegal child in the event of your death. Always lurking just around the corner, eroding the buying power of hard-earned dollars, is the specter of inflation. Even moderate inflation can have harmful effects on your lifestyle and purchasing power. For example, in just 15 years, a 4% inflation rate will almost double the cost of everything you buy. An option? Place a portion of your portfolio in growth-oriented financial products, provided these are suitable investments for your individual financial solution. There may be risk to your capital, but over the long haul, you may be rewarded with returns that keep you ahead of inflation. 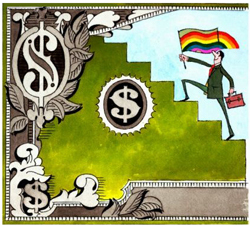 Failure to Plan — Most GLBT families don’t put together a cohesive plan for reaching their financial goals. However, with a comprehensive and flexible plan, you can have a blueprint for success. Insufficient Diversification — “Don’t put all your eggs in one basket” is an excellent rule of thumb. True diversification utilizes a variety of different products, asset categories, and lengths of maturity in an attempt to reduce risk and raise the potential for a positive return. Always remember to use products that will allow you to roll your assets over to your partner and/or a non-legal child in the event of your death. Inadequate Life Insurance — Failure to cover all income earners with a sufficient amount of life insurance can cause a burden for survivors. Again, you will need to be sure that you name your partner and/or non-legal child as the beneficiary, to ensure that they will receive the financial assistance they need in the event of your death. No Estate Plan*** — Some people think that estate planning is just for the wealthy. Not necessarily true. A proper estate plan can help reduce exposure to applicable taxes and provide heirs with an inheritance. In addition, an estate plan can help to ensure that the courts recognize your partner and/or nonlegal child as the beneficiaries should you pass away. Unfortunately, from time to time disaster strikes, and we end up paying the bill. We can do little to prevent death and disability, but through sufficient insurance coverage, the financial damage can be lessened. Life insurance proceeds can provide GLBT families with the means to pay final expenses, defray lost income, and continue to live in the lifestyle to which they’re accustomed. Disability income insurance covers a portion of your or your partner’s salary (usually 50-60%) if one of you becomes unable to work due to disability. Private insurance, such as long-term care insurance and Medicare Supplemental Insurance, may help fill in the gaps of government-sponsored programs. Yes, T.I.M.E. marches on, trying to wreak havoc on your finances. It can be particularly devastating for gay and lesbian families, who are often denied certain tax breaks, and whose finances may be at the mercy of the court should one partner die unexpectedly. But you can have the final say: With proper insurance and personal planning, you can limit the ravages of T.I.M.E. in order to retire with a comfortable nest egg. For more information on insurance and other financial products that can help you deal with T.I.M.E., please contact Mary L. Stockton at 858-623-8945. * Loans reduce the death benefit and accrue interest. ** Products available through one or more carriers not affiliated with New York Life; dependent on carrier authorization and product availability in your State or locally. *** For 2007 and 2008, the estate tax exemption is $2 million, increasing to $3.5 million in 2009. In 2010, the estate tax is repealed for one year only, resuming in 2011 for estates over $1 million.